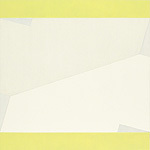 Don Voisine has long worked with a reductive vocabulary of hard-edged, geometric abstraction painted in oil on wood. For years he has explored the seemingly limitless compositional possibilities of overlapping geometric forms rendered in glossy and matte black paint against light-colored grounds. The central black shapes are further defined by directional brushwork which captures the light, setting one form off from another. Sometimes symmetrical, sometimes irregular, these geometries engage in shifting spatial interactions within a confined format, bordered top and bottom or left and right by uniform bands of brighter colors. Two new developments in Voisine’s use of color distinguish works in this exhibition. 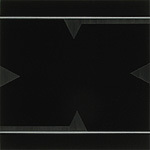 Some works are executed almost entirely in varying tones of black, appearing nearly monochromatic. Here, Voisine’s forms emerge from a mysterious space, enlivened by a single contrasting color. 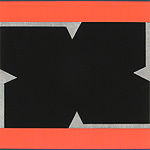 In other works, black is abandoned altogether in favor of contrasting reds in the central area, or with opposing tonalities of light cream, white and gray. In addition, the grounds in some paintings are more muted and less contrastingly light, and the geometric forms do not necessarily overlap. Instead, they abut one another with a sharp diagonal edge or crease. In these light-colored works, the space reads as a distinctly sculptural or architectural environment; the illusion of a bend within the central compositional area is remarkable. 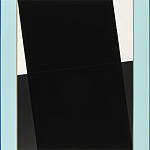 In other paintings, rectilinear forms set one within another recall the architectural drawings which were the initial inspiration for Voisine’s abstract compositions. When the geometric forms are set side by side rather than overlapped, a rhythmic back and forth movement, or a sense of infinite expansion, is created. No matter the scale, Voisine’s paintings feel taut, elegant, and unswervingly sensuous in their severity.